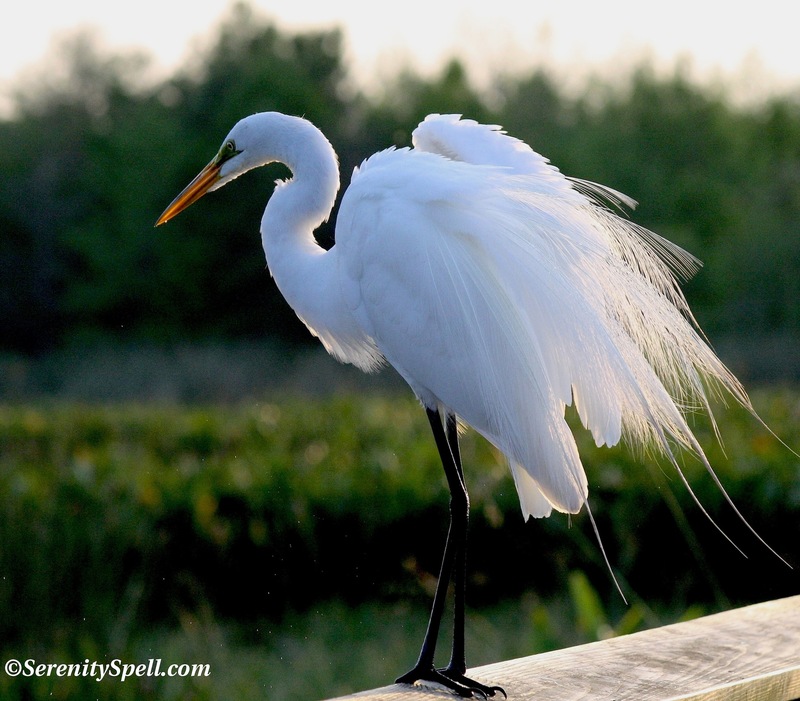 A Great Egret meticulously preens its most lovely breeding plumage (captured from the early Spring), the gossamer feathers lit in the setting sun over our protected wetlands. May your weekends be just as luminous and carefree as this lovely creation! ← Paying It Forward: A Giveaway Contest! 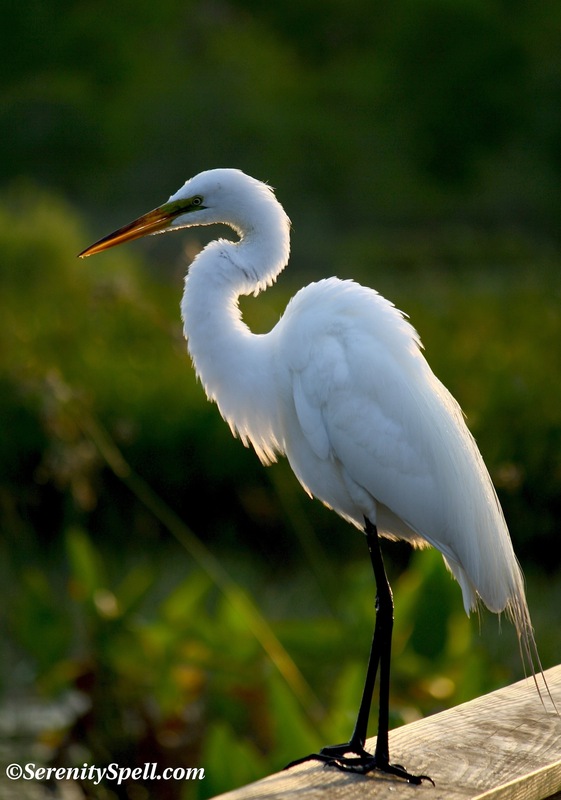 Ahhhh…to be more egret-like. I think I’ll start a movement. 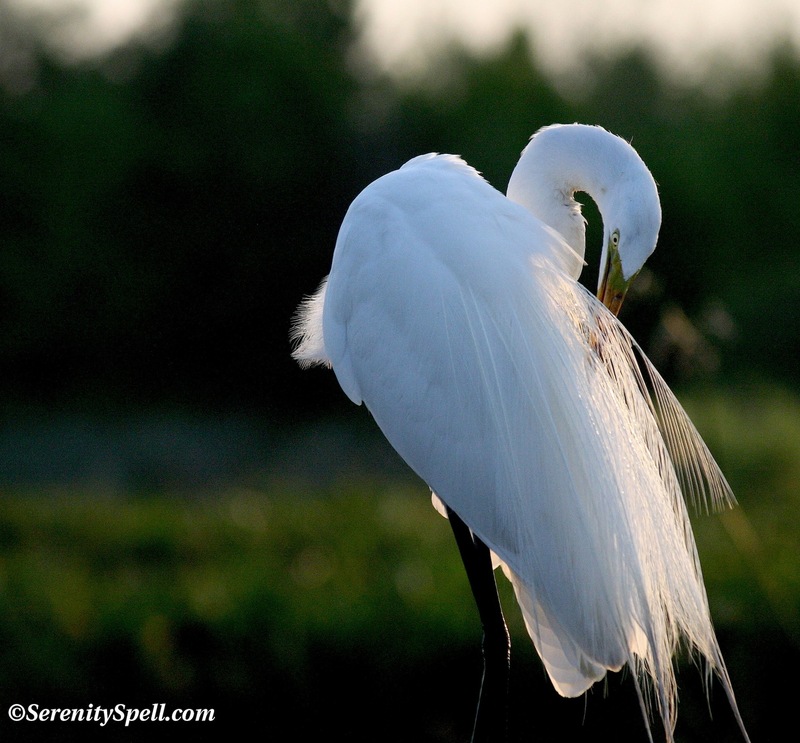 Peace of the egret be with you.Or like ‘bark less, wag more’ – it’s ‘squawk less, preen more’? I’m so glad you enjoyed them both! I adore Emerson. I need to resume massages — learn from my animals! Yes! Love all your photos you are amazing! I luv this … photos and words and what it means ,,, so nice ,,, and inspiring,, thank u for sharing this it s beautiful. OMGEEE! You just keep going from strength to strength, Feygie! How in Cod’s name could anything be so utterly incredibly finely beautiful, and yet survive in this cruel world? Yowzers!!! And I love the Emerson quote. Very humorous and wry and full of compassion. You are the best, for putting these jewels of posts together for us. Just the best, the best. Total appreciation to you. How WONDERFULLY kind, I don’t even know where to begin! Thanks very much for your words — they truly mean so much. I adore Emerson — such a wise and wry man. And these amazing creatures… As one fellow naturalist pointed out, can you believe that they were nearly hunted to extinction for their beautiful feathers? If it weren’t for the efforts of men who died (literally) for them, to protect them), we wouldn’t be in awe of them today. You know, I can believe they were almost wiped out — that was one of the first thoughts that struck me as I reeled in their beauty. “Too beautiful to last,” I thought. “Bet ladies wanted these for their hats.” People died to protect them? Bless their memories. They saved a precious part of life, as they themselves perished. Yep, one of the first game wardens of this country, devoted to protect these birds’ rapidly dwindling numbers — murdered in the line of duty. I’m going to be devoting a post to him soon. Heroes that many don’t know about! Well, master Fey, I have to tell you – it is only all too obvious that you have it in with mother nature. She just catch stop herself from posing for you!!! Thank you for the beautiful photos!!! Aw, what a wonderful compliment! I love that perspective and thought — that Mother Nature poses for me. 🙂 So very sweet! But I believe it is true – have gander at Penelope Smith’s book , WHEN ANIMALS SPEAK. I think there is more to what you are doing than you think!!! Just re Florence (because I cannot squeeze in the reply button) even here, though she be just a statue, she has connected with the people of Toronto making them aware of mooseness (all be it , somewhat on a funny human level) in us all. She is speaking to us, drawing us into the animal world, not letting us completely disconnect, holding our attention first the community, then all passersby and from there who knows what her influence may be. Because her face is kind, our feelings for her are kind and hence I think our feelings for the real being as someone majestic and powerful, insightful and worthy of recognition may translate into newer respect for them in the wild as such beings!!! Oh I’ve read Penelope Smith and her book — it’s a classic, and I love it. What you say is exactly true, too, about Florence. She’s a wonderful, gentle reminder…! I love that bird – and Ralph Waldo has always been one of my favorite American writers. Such optimism! Thanks for sharing. I’m so glad you enjoyed Emerson — I agree, he resounds with such optimism and amazing truths. I have *so many* of his saved quotes! Ah, I’m so glad you enjoyed! I love Emerson — he always resounds with such amazing truths. Those people who used to kill these birds for their plumage sure had it all wrong. Those feathers look at least a million times better on the birds! SO TRUE. I can’t fathom killing these amazingly gorgeous creatures for what…hat feathers? But there were people who died to protect them — and other bird species — in the early last century. Birds are sooo difficult to shoot….you’re a real professional! Your photos are so beautiful and serene, Fey. Nice quote. Yes, I think animals probably end each day this way. 🙂 We’ve got much to learn from them (at least I do 🙂 ). Wow wow wow wow wow! Such exquisite shots! Thank you thank you thank you! 🙂 I know how fortunate I am to be surrounded with such beauty…. Gorgeous! A wonderful bird.. incredible light.. and very fine captures. Thanks so much! I’m extremely lucky to be surrounded by these guys, and their (restored) Everglades habitats. Really? So many people LOVE them here, too! They’re so bright and quirky! Love that quote, and the pictures are awesome. beautiful! congrats on your POTW! thanks so much — i found her / it! following now, too; what a wonderful site! Congrats on POTW! Love the use of light highlighting the feathers of this beautiful bird. Thanks so much! I had no idea what POTW stood for, until someone kindly explained it… 🙂 Now I have to find it! Hah! I was really lucky to catch this lovely at dusk — the setting sun did it all! The egret photos were just stunning. I loved the way the light played around the edge of the feathers. Hello! Visiting via our friend, Hilary! Such nice photography! What a lovely quote. Enriching and energizing. Thanks much for that and for the gorgeous pictures! You bring me much tranquil delight. How incredibly kind of you to say so — thanks so VERY much! !